In 1704, the Safavid Shah Husayn appointed his Georgian subject and king of Kartli George XI (Gurgīn Khān), who had converted to Islam like many other Georgians under Ottoman or Persian rule, as the commander-in-chief of the easternmost provinces of the Safavid Empire, in what is now Afghanistan. His first task was to quell the uprisings in the region. Gurgin began imprisoning and executing Afghans, especially those suspected of organizing rebellions, successfully crushing the rebellions. One of those arrested and imprisoned was Mir Wais who belonged to an influential Hotak family in Kandahar. Mir Wais was sent as a prisoner to the Persian court in Isfahan but the charges against him were dismissed by Shah Husayn, so he was sent back to his native land as a free man. In April 1709, Mir Wais along with his followers revolted against the Safavid rule at Kandahar, Gurgīn Khān along with all Persian military officials were killed. The Afghans then defeated a twice as large Persian army that had been dispatched from Isfahan (capital of the Safavids), one which included Qizilbash and Georgian/Circassian troops. Several half-hearted attempts to subdue the rebellious city having failed, the Persian Government despatched Khusraw Khán, nephew of the late Gurgín Khán, with an army of 30,000 men to effect its subjugation, but in spite of an initial success, which led the Afgháns to offer to surrender on terms, his uncompromising attitude impelled them to make a fresh desperate effort, resulting in the complete defeat of the Persian army (of whom only some 700 escaped) and the death of their general. Two years later, in A.D. 1713, an­other Persian army commanded by Rustam Khán was also defeated by the rebels, who thus secured possession of the whole province of Qandahár. Refusing the title of king, Mirwais was called "Prince of Qandahár and General of the national troops" by his Afghan countrymen. He died peacefully in November 1715 from natural causes and was succeeded by his brother Abdul Aziz. In 1720, Mahmud's Afghan forces crossed the deserts of Sistan and captured Kerman. His plan was to conquer the Persian capital, Isfahan. After defeating the Persian army at the Battle of Gulnabad on March 8, 1722, he proceeded to and besieged Isfahan for 6 months, after which it fell. On October 23, 1722, Sultan Husayn abdicated and acknowledged Mahmud as the new Shah of Persia. Ashraf Hotaki, who took over the monarchy following Shah Mahmud's death in 1725, and his soldiers were crushingly defeated in the October 1729 Battle of Damghan by Nader Shah. 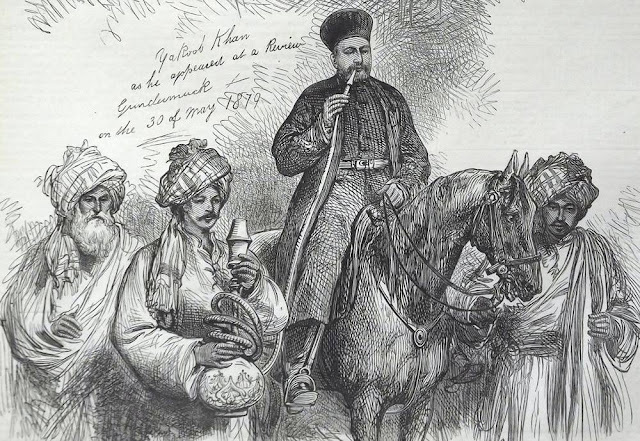 Nader Shah's forces conquered Kandahar in 1738. They besieged and destroyed the last Hotaki seat of power, which was held by Hussain Hotaki. The new Shah of Persia, Fath Ali, supported a pretender to the Afghan throne against the Afghan King. The pretender, Muhammad Barakzai overthrew his brother, Zaman, with help from an invading Persian army. Persia invaded Afghanistan and occupied the western Afghan city of Herat. Local Afghan guerrillas forced the Persians to exit Afghanistan. Persia invaded Afghanistan and laid siege to the western Afghan city of Herat. Persian assaults on the city failed, and the invading army gave up the siege (September 28, 1838), and returned home. Persia again invaded Afghanistan, this time successfully capturing Herat. This upset the British, who claimed influence over Afghanistan. The British Empire declared war on Persia (Nov. 1, 1856), and proceeded to invade Persia both by sea and by land. British forces landed and took the Persian port of Bushire in January, 1857. An Anglo-Indian army invaded Persia, which soon gave up and agreed to evacuate Herat.